Some critics of the decision to play Miguel Sano in the outfield imply that there's no problem with him at third base. Not so. Nice recovery by the first baseman, however. Scratch the notion of a September return for Phil Hughes. The veteran right-hander will have thoracic outlet syndrome surgery next week. 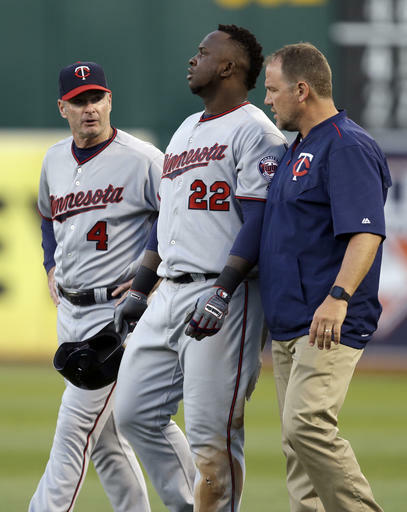 Former Twins pitchers Deolis Guerra and Hector Carrasco also underwent the procedure, which involves the partial removal of a rib to relieve nerve and circulation issues in the throwing shoulder area. The hope -- expectation? -- is that this will solve Hughes' shoulder fatigue issues. He was already out with a leg fracture, but now he won't be back until spring training 2017. Also from Berardino: Max Kepler got a fairly high-level rebuke last weekend from Reggie Jackson, who watched the rookie take aim at the right field seats during batting practice in Yankee Stadium and told him: "I'm 70 years old and I can do that. Let me see you go the other way." I'll bet Kepler hears that from Tom Brunansky and Rudy Hernandez a lot. Hearing it from a 500-homer Hall of Famer apparently had some influence on the German. Only one Twins prospect named to the Futures Game rosters Tuesday, J.T. Chargois. I'm mildly surprised at one; there are a handful of others I would have thought worthy, such as Tyler Jay or Stephen Gonsalves. Nobody gets more than two on the initial rosters, and there are a few teams that only get one. It's possible that the Twins declined to send one of the lower level prospects across the country to San Diego. He's a third baseman. He's a right fielder. He's a designated hitter. He's still on his major league rehab assignment. Miguel Sano's last major league action came May 31. He started his rehab assignment in Rochester on Friday, and with Trevor Plouffe sidelined at that point by a groin strain, the rehab plan was refocused on getting Sano ready to play third base, perhaps as soon as tonight in Chicago. But on Sunday Plouffe was back in the lineup (and hitting a home run). And Sano was wrapping up a one-hit weekend in which the reports were that he was obviously rusty. The rehab stint, it was announced, will be at least six days, not the three that was raised as a possibility, and right field is back in the picture. On Monday Sano homered for the Red Wings. He also struck out twice and was charged with an error in right field. He'll be back with the Twins soon enough. What he'll be doing with the Twins is unknown. It's become pretty obvious that the Twins are making it up on the fly, reacting to other variables. And with Terry Ryan promising trades in the coming weeks, keeping their options open is probably wise. I expected that Tampa Bay would try to protect its pitchers by restricting Arcia to designated hitter. But his first two games with the Rays came in right field. Arcia drove in four runs in those two games. The Rays lost them both anyway; they have lost 11 in a row, a depth even the Twins haven't plumbed this year. One of my first thoughts at the news that Arcia had been traded to Tampa Bay for a player to be named was: "Maybe they can get Hu back." 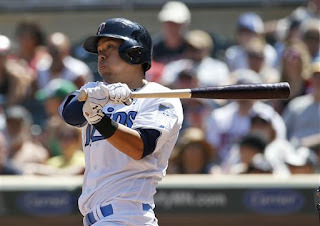 Chih-Wei Hu is the Taiwanese right-hander the Twins sacrificed last year to get Kevin Jepsen from the Rays. I hadn't checked in on him this year, so that thought prompted a stat check. Conclusion: Not very likely. Hu, now 22, plays for Montgomery in the Double A Southern League (same league the Twins have their Double A affiliate in), and he put up a 2.34 ERA in his first 13 starts. He also has one Triple A appearance, which didn't go as well as his one Triple A appearance last year did. Arcia will have to be mighty productive in Tampa Bay to merit an upper-level prospect as productive as Hu has been. Tyler Duffey had been pretty brutal in recent starts, but he sure had a good one Sunday: two hits and no walks with eight strikeouts in eight innings. Whatever inclination the Twins might have had to move Duffey out of the rotation has probably been shut down now. 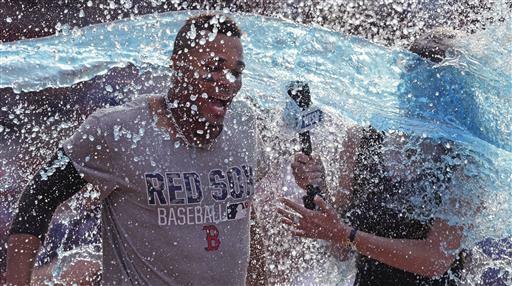 This kind of thing is increasingly a job hazard for the on-field TV interviewers. Looks like she got it pretty solidly this time. Oswaldo Arcia's time in designated-for-assignment limbo ended Friday when the Twins traded him to Tampa Bay for cash or a player to be determined. I expect to make this the topic of the Monday print column, so suffice it to say that I think the Rays are a good team for him. They're smart enough that they aren't likely to insist that he play outfield. Trevor Plouffe's most recent injury (groin) is probably behind the latest change in plans with Miguel Sano's rehab assignment. The description supplied earlier in the week was: third base on Friday, DH on Saturday, right field on Sunday, see where he's at. By Friday it had become: Five innings at third on Friday, seven innings at third on Saturday, DH on Sunday. At which point they may well stick Plouffe back on the disabled list and bring Sano back. Alex Kirilloff, the high school outfielder the Twins selected with the 15th overall pick earlier in the month. signed for slot ($2.8 million) this week and is expected to make his debut today with Elizabethton in the Appy League. The Twins have signed 28 of their 42 picks. That may be a higher-than-usual percentage, but they went heavy on collegians in the second and third day, and the bulk of draftees who don't sign are later-round high schoolers who can reasonably hope that a few years in college will boost their status. I can't recall hearing before of a specific pitcher whose labrum had to be reattached, but it probably has happened before. Neal says this likely stretches out the timeline for Perkins' return. My expectations were already so low that I'm not sure this dampens them. Shoulder surgeries of whatever ilk -- labrum, rotator cuff -- have a pretty poor track record. 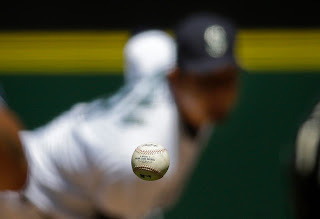 I can think of a few relievers who have had them and eventually recovered their form (Jesse Crain and Grant Balfour being two, although Balfour also had Tommy John at the same time), but they are the minority. That the damage found once the joint was opened is worse is doubtless a blow to Perkins' hopes. It also, I dare say, illustrates the basic foolishness of hiding injuries. I wrote earlier this week of some notably declarative utterances by Twins general manager Terry Ryan about Miguel Sano on Sunday. Since then the Twins have been considerably more vague about Sano, who is slated to play Friday in a rehab assignment with Triple A Rochester. Sano was quoted this week as saying that as far as he knows, he's still an outfielder. Paul Molitor suggested that the nature of Sano's injury (hamstring) may lead to keeping the big slugger out of the outfield. The word from the TV broadcasters Wednesday night was that Sano is to play various positions during his rehab stint. Meanwhile, Trevor Plouffe has had games at first base and designated hitter as well as at third this week, and Byung Ho Park has sat a few times. To be sure, Molitor suddenly has a number of hot-hitting infielders to fit into the lineup, but the bulk of the where-does-Sano-fit chatter still leads to third base or designated hitter rather than the outfield. First Kepler -- who did mishandle a ball earlier in the game that cost the Twins a pair of runs -- made a diving catch in right field. Buxton followed with the catch shown at right. Lesser outfielders don't make those plays. And Sano is definitely a lesser outfielder. To be sure, outfielders need to hit too. Kepler drove in a pair of runs Wednesday and Buxton singled, walked and scored, so that was good too. How insulated and absorbed in baseball is a major league general manager? NYC next. Terry Ryan hadn't heard of @HamiltonMusical. "Who's Hamilton? I know Josh. I know Billy. I know Hamilton, Joe Frank & Reynolds." Last season Tyler Duffey pitched 58 major league innings, posting a 3.10 ERA with four home runs allowed. After Tuesday's ugly start (three innings, six runs, three homers), Duffey this season has worked 59.2 innings with a 6.18 ERA. Almost the same amount of innings, almost double the runs allowed. I had been inclined to blame Duffey's spring training struggles on a one-size-fits-all coaching philosophy. Neil Allen wants everybody to throw a changeup, and Duffey didn't last season. He threw two fast balls (four seam and two seam) and two curves (one smaller and harder, the other larger and slower). Duffey entered camp with a rotation spot and was urged to spend spring training developing a straight change. He did so, got hammered, and wound up losing the rotation spot for a few weeks with a minor league demotion. But now he's in the majors, he's not (apparently) getting hit on changeups, and he's nowhere near the out machine he was down the stretch in 2015. His strikeout rate is slightly lower this year, but his walk rate has improved, and his strikeout-to-walk ratio is much better. Those are the leading indicator stats that still give me some optimism about Duffey. But those home runs are sure adding up: eleven and counting this year, after just four in his rookie year. He yielded three Tuesday night alone. To me, this suggests that control and stuff aren't the issue. Command is. Drawing a connection between his 2016 struggles and his big increase in innings (majors and minors combined) in 2015 may not be accurate, but it's possible the latter caused the former. So where do the Twins and Duffey go from here? Duffey has to be considered a candidate for demotion, but Jose Berrios hasn't exactly been tearing it up in Triple A since his demotion, and the only other healthy starters left on the 40-man roster are the just-demoted Pat Dean (not eligible yet for recall) and Randy Rosario, who is in high A ball and not anywhere near the radar screen for a callup. Between the shortage of viable alternatives and the still-respectable walk and strikeout stats, I would advocate patience with Duffey at this point, but I can't say I'm very enthusiastic about that recommendation. odd about Kurt Suzuki's current bat. Interesting piece by the Pioneer Press' Mike Berardino about Kurt Suzuki's switch to an "axe-handle" bat. I had read a Baseball America piece on the (slightly) increasing use of the handle earlier this year, but I can't say I've spotted one in use. Judging by the above photo, taken since Suzuki is said to have converted to the new bat full time, there may not be enough difference to really notice, especially when the hitter has both hands on the bat. Jones has been assigned to Double-A Chattanooga, and we'll obviously see what happens from here. The Twins were off Monday, and I spent the evening running errands and mowing, but I did catch an inning of Steven Wright's knuckleball pitching. He went nine innings of one-run ball (unearned) against the White Sox, but the White Sox won in 10, beating Craig Kimbrel. ("Hey, a fast ball. I know how to hit something hard and straight!") The run was unearned because it scored on a passed ball, but really -- passed balls with a knuckleballer on the mound are more the fault of the pitch than of the catcher. Wright has now made 14 starts for Boston this year, 98.1 innings with an ERA of 2.01. There is speculation that he might start the All Star game next month. It's fun to watch a flutterballer work, partly because it looks easy enough. I can watch, say, Ervin Santana pitch and know I could never throw with that velocity (and he isn't a particularly hard thrower). Looks easy but it obviously isn't. There are only two true knuckleballers in the bigs now -- Wright and R.D. Dickey of Toronto -- and they both spent years in the minors refining the pitch. Terry Ryan, in his semi-regular radio appearance Sunday, said that the current plan is for Miguel Sano to go on a rehab assignment later in the week. And when the big guy returns to the majors, it won't be as an outfielder. He'll DH, the general manager said, while deferring to the absent manager, Paul Molitor. He'll play third base some. He might even play some first base. But not right field, which was Sano's usual position before his hamstring pull, because of the leg issues. Sano's future? Said Ryan: "No question, it's third base." No question? Really, Mr. Ryan? I am, let us say, dubious of the implication that it will be easier to keep Sano healthy and in the lineup as a third baseman. I can, off the top of my head, rattle off the names of several third basemen whose careers were curtailed or limited by back problems, from John Castino to Ryan Zimmerman. Anecdotally, the position seems to be tough on backs. And personal experience tells me than hamstring issues and back issues tend to go hand in hand; an injury to one often presages an injury to the other. That said, Ryan has more qualified medical and training advisors than me. And Sano obviously did not fare well in the outfield. I've said before that there is probably never going to be a position at which Sano is the best defensive option; wherever he plays, there's going to be a trade off of defense for offense. Which makes the question: Where does Sano least hurt the club? The Twins brain trust decided early in the offseason that the answer was right field, in part because that allowed Trevor Plouffe to remain the third baseman. Another question: How do the Twins reshape the roster if Sano is no longer to play outfield? Ryan has in the past suggested that maintaining Sano's weight is a reason to have him playing a position and not be primarily a designated hitter. In the short term, DH may have to be the fall back, as it was in the second half of 2015. If he's going to be the DH the rest of the way, there's no real purpose to Byung Ho Park's presence on the roster. But if Sano is "no question" a third baseman in the future, that takes away Plouffe's position. (And if he's no longer an outfielder, that makes it easier to give Max Kepler a sustained opportunity.) I said in today's print column that I will be disappointed if the Twins don't deal away at least one of their veteran infielders before the trading deadline, and I focused on Plouffe and Brian Dozier. I wrote that before hearing Ryan. Nothing I heard him say contradicts my thinking, even though his concern is fitting Sano into the lineup rather than Jorge Polanco. Third question: Why not both? Bottom line: The Twins shaped their 2016 plans around Sano in the outfield. 2016 has not gone well, and that plan is being jettisoned. But the roster has to be reworked to reflect that new reality. 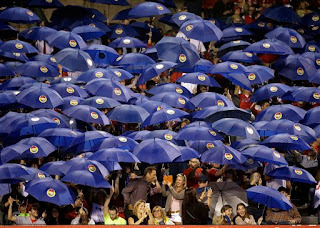 some sort of record for open umbrellas. As I see it, there is a moral hazard to me ridiculing other people' activities as meaningless or time-wasting. After all, I'm writing something pretty much every day about professional baseball, which is a kids game played by adults. And in a overly depressing sense, someday the sun is going to explode and our planet will become a charred orb with nobody left, and nothing we do today will matter anyway. Still ... I don't get this. Good thing I don't have to. A newsroom colleague and I agreed Friday afternoon that among the Twins' problems is a lack of quality nicknames. I promised that if Pat Dean had a good outing that evening I would launch a campaign to dub him "Ditsy Dean" in tribute to Dizzy Dean and Daffy Dean. Alas, the contemporary Dean didn't make it out of the third inning, allowing eight hits, three walks and seven runs in 2.1 innings. I won't insult the Gashouse Gang aces by implying that Pat Dean is on their level. Pat Dean, his ERA having ballooned to 5.54, was shipped back to Triple A Rochester after the game, and Tommy Milone -- remember him? -- was summoned. The Twins waived Milone in early May after four starts and one relief outing in which he compiled a 5.79 ERA; I was surprised when he went unclaimed and the Twins got to stash him in Rochester. 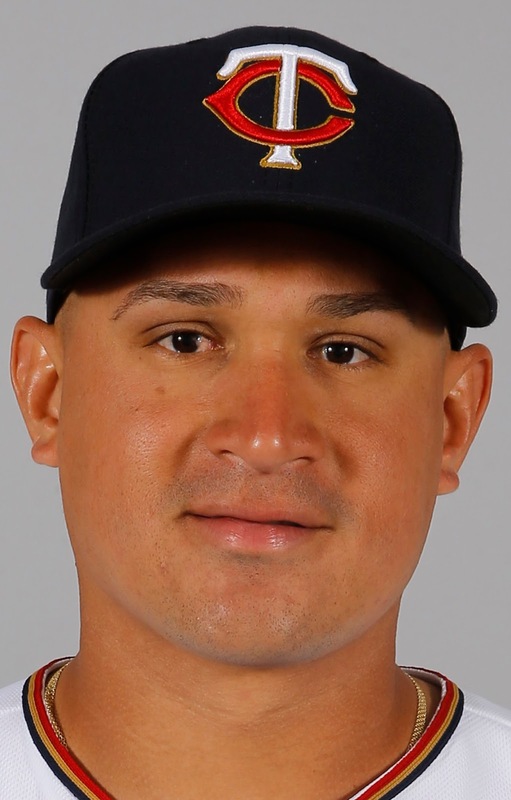 He dominated the International League -- 4-0, 1.66 ERA in seven starts, 48 innings with 41 strikeouts -- and so now the finesse lefty gets another shot in the Minnesota rotation, although he is going to be on call for long relief duties the next couple of days. And so the roster shuffle continues. Milone, of course, fills the 40-man roster slot vacated on Thursday when Oswaldo Arcia was designated for assignment. I'm glad he's back; there was never any serious reason to believe that Dean was a better starter than Milone, assuming that Milone was physically sound. Waiving him on the basis of 23 ineffective innings was something of a panic move. The Twins simply decided they couldn't stand pat, then and now. Danny Santana and Oswaldo Arcia both made the major league roster coming out of spring training largely because they were both out of options. Arcia was the first to run out of chances. He was designated for assignment Thursday night to make room on the roster for Santana, who is ready to be reactivated from the disabled list after his second hamstring injury of the season. I saw this coming last winter and said so repeatedly. Arcia is just 25, and he has genuine power. That is the sum and total of his positives. On the other side of the ledger, he's an awful defensive outfielder, his strike zone issues are significant, he hasn't hit lefties much and he's not much of a base runner. And he wasn't getting better at any of those things. Santana is a flawed player also. But he has a wider set of tools. He can run. He can throw. He switch hits. He can play infield and outfield. There are, in short, more things the manager can put him in the lineup to do than there is with Arcia. That makes him a better bench piece than Arcia. And neither could be projected as a regular at this point. Arcia does not deserve playing time over the likes of Byron Buxton, Max Kepler, Miguel Sano, Robbie Grossman or Eddie Rosario. Neither, for that matter, does Santana. I surmised earlier that Glen Perkins' pending visit to noted orthopedic surgeon Neal ElAttrache suggested that the three-time All-Star wasn't likely to pitch again this season, and so it is. ElAttrache is to attempt to repair Perkins' frayed labrum in the next seven to 10 days. The hope is that Perkins will be back next year. But shoulder surgeries are tricky; as a general thing, shoulders are to be maintained and elbows repaired. It was, you may recall, a frayed labrum that drove Brad Radke into retirement at age 33. Perkins happens to be 33 now himself. It would be unwise to count on Perkins as a key bullpen piece in the future. If it happens, great. But the Twins shouldn't plan on it. 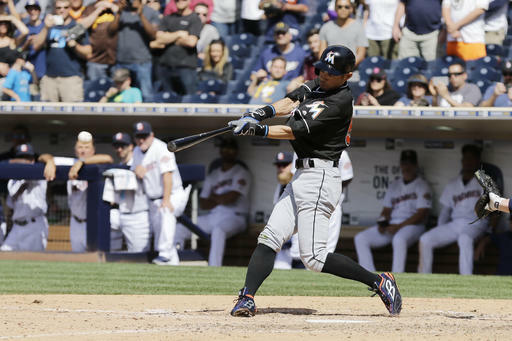 Ichiro Suzuki bangs out a double Wednesday in San Diego. Ichiro Suzuki is having quite a season. The 42-year-old outfielder is hitting .349 as of this morning, and even without power (six doubles and no other extra-base hits) his OPS (On-base Plus Slugging) is a respectable .807. We don't, of course, because these leagues are not directly comparable. This hardly detracts from Ichrio's accomplishments. He's almost certain to pass 3.000 hits this year -- that's made-in-the-USA (and Canada) MLB base knocks, which is pretty impressive even without considering that he didn't get to play in North America until he was already 27. There can't be any serious question that he was capable of hitting well in MLB well before then. His late start here reminds me of Lefty Grove. Grove won 300 games with the Athletics and Red Sox, pitched 17 years in the majors. But he also won 111 games in the minors, 108 of them for the Baltimore Orioles in the International League at a time predating farm systems. The Orioles were a minor league team, yes, but they were better than many major league clubs. Jack Dunn built an absolute powerhouse and he wasn't letting his stars go easily after being forced by finances to sell off a young Babe Ruth. Grove won 25 games for Baltimore in 1921, 18 in 1922, 27 in '23, 26 in '24. At which point the other IL owners, tired of getting hammered year after year by the Orioles, voted to subject their league to the major league draft, and Dunn was forced to sell off his stars rather than lose them for a pittance. Which gave Grove enough MLB time to get to a round-number milestone, get inducted into the Hall of Fame, establish a record that echoes decades after his death. But he didn't get to start building that major league record until he was already 25. Ervin Santana fell to 1-7 Tuesday night. Won-loss is a lousy metric by which to measure a pitcher, but 1-7 is pretty extreme. His 5.10 ERA is too. This is the Twins opening day starter, their putative ace. News flash: He's having a bad season. This is not unprecedented. Santana has had three 20-plus start seasons with ERAs that begin with 5. In 2007 he went 7-14, 5.76 (26 starts, 150 innings); in 2009 he went 8-8, 5.03 (23 starts, 139.2 innings); in 2012 he went 9-13, 5.16 (30 stats, 178 innings). All three seasons came with the Angels. And in other years he generally provides 200-plus innings with an ERA under 4. There's no year-to-year consistency in his results. He is either a reliable anchor for the rotation or a problem. The odd thing to my eyes: His strikeout and walk rates, the "leading indicator" stats I typically find most informative about a pitcher, are consistent in good years and bad. His BB/9 and K/9 rates this season are in line with his career norms. This is Santana's 12th major league season, and it's shaping up to be Problem Year No. 4. One in three. He signed a four-deal deal with the Twins; you almost have to expect at least one year like this from him in that span. 23 pitchers on the season. to the Twins' most recent roster addition. Or both. Neil Ramirez on Monday because the 23rd pitcher deployed by the Twins. The first batter the 27-year-old righthander faced in his ninth inning outing homered, but then he went popup-strikeout-popup, and the Twins won 9-4. Twenty-three pitchers seems like a lot of arms to go though, and it is. Two of the 23 made just one appearance with the big league club (Graham and J.T. Chargois); two others (Alex Meyer and Perkins) just two. With Glen Perkins headed to LA for third opinion on shoulder, Dr. Neal ElAttrache at Kerlan-Jobe appears to be the orthopedist of choice. ElAttrache is the surgical star of "The Arm," the must-read baseball book of the season. He will be the third physician Perkins has consulted about his shoulder. I do not expect to see Perkins on the hill again this year. he brings home his game-winning home run. Pretty sweet moment Sunday for Max Kepler, the Berlin Basher, who hit a three-run homer in the bottom of the 10th for a rare Twins win in which they never trailed. It was the first career homer for Kepler,. 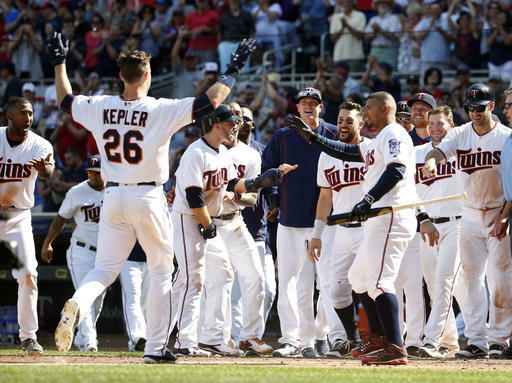 Kepler has been playing right field on a regular basis this month with Miguel Sano sidelined, and one would be hard pressed to claim that he's taken the job and run with it. His 1-for-5 Sunday leaves him 8-for-36 in June, a .222 average, and he's struck out 12 times. He's also had four hits in his three most recent starts. It may be some time before Sano is deemed ready to return from his hamstring injury, and presumably Kepler will remain a lineup fixture until then. What will happen when Sano is back, I haven't the slightest. I think the highest-ceiling outfield the Twins can assemble would be Kepler in left, Byron Buxton in center and Sano in right, but that leaves no place for Robbie Grossman, and he is playing, overall, better than any of that trio. J.T. Chargois came up, made one awful appearance, and got shipped back to Rochester. The Twins claimed Neil Ramirez off waivers from Milwaukee to take his place on the 25-man roster. In theory, I dislike this move. Chargois is more talented, and he's not that much younger. Milwaukee is the second club to dump Ramirez this season, and that should be a red flag. they have trouble getting five or six innings from their starters. If the bullpen has to pick up four or five innings every game, they can't afford to carry an arm that's only available for one inning every two or three games. To make room for Ramirez on the 40, the Twins moved Phil Hughes to the 60-day disabled list. Hughes suffered a "compression fracture" when he was hit by a line drive in the leg the other day. Michael Tonkin also got drilled by a comebacker; it's been a bad week in that regard. Wrapping up the draft: The Twins made 42 picks over the three days. On Day One they selected four high-school hitters; after that they went heavy on collegians. Thirty-one of their 42 picks are college guys, including 24 of the 30 Saturday selections. By the numbers: 17 pitchers, 10 outfielders, eight infielders. seven catchers. We knew the Twins regarded their catching depth as suspect, and they certainly went for backstops early (second round), often and late (40th round). One of the Twins' first day selections was compensation for failing to sign 2015 second-rounder Kyle Cody of the University of Kentucky. Cody fell to the sixth round this year (Texas Rangers), and the big righty will have a substantially smaller signing bonus as a result. The Twins may well have wound up with the better prospect in Akil Baddoo, a high school outfielder. Still, punting a high pick like that isn't a good strategy. Gomez reacts to a 10th-inning strikeout. I don't know to what degree Gomez' problems are related to his injury. If he's sound, I would expect him to get it going. He's a talented athlete with a record of success and he's only 30. But it sure has been a prolonged slump. The Twins opened the second day of the draft by taking Griffin Jax, a right-handed pitcher from the Air Force Academy, with the 93rd overall pick (third round). Deron Johnson is here: "We loaded up on bats yesterday. Jax is very interesting kid. Really good makeup. Reminds me of Radke. Up to 95." Deron Johnson is the Twins scouting director, which means he's the guy making the call in the rapid-fire rounds of the draft's second and third days. Obviously the Twins like Jax, who apparently draws the Brad Radke comp mentioned above by having a good change up. I have no basis to judge the talent, but I don't particularly care for pursing somebody from a service academy. My thinking is related to a hoary Branch Rickey rule. He refused to sign a player who was in medical or divinity school on the basis that the world needs physicians and ministers more than it needs ballplayers. My take on the service academies is: The nation has a deal with these students. We the people provide a no-charge, high-level college education, and we get well-trained military officers. I object to the notion that they can/should be encouraged/allowed to walk away from that bargain three years in, with a heavy public investment in that bargain. Berandino reports that Jax "will petition for a deferment of his five-year active military commitment, and the Twins are hopeful that he will be able to convert that to the reserves at least." Maybe so. That doesn't make it right. I predicted in Friday's post that Trevor May would go on the disabled list. He did. So, too, did Phil Hughes, who took a wicked liner off his leg. Kyle Gibson was reactivated off the disabled list; he's to start today's game against the Red Sox. And J.T. Chargois was called up. I've mentioned Chargois a few times this year as somebody I thought should be here. The reports on his callup gave a good reason for the Twins to have gone slow: He has only once pitched on consecutive days this year. That's by design as his continues to return from Tommy John surgery. Still, I'm glad to see him in the majors. He is a absolute power arm. It's time to start seeing some of them in Minnesota. ESPN's Keith Law, in a chat Friday about the first day of the draft, said he hasn't seen Twins second-round pick Ben Rortvedt himself, but that the word he has from scouts is that he won't stick behind the plate. The Twins suggested otherwise on Thursday, and time will tell. He'll catch until he convinces the Twins he shouldn't catch. The Twins did take another potential backstop in the ninth round Friday, Mitchell Kranson of California Berkeley. Apparently he played mostly third base for Cal (and hit third), but the Twins intend to put him behind the dish. That parallels the career path of Terry Steinbach, who played third base for the Gophers and converted to catcher after signing with the A's. May it work that well with Kranson. High school outfielders and college pitchers. As a general rule, that's what the Twins take in the first round of the draft. This year, it was a prep outfielder, Alex Kirilloff of Plum, Pennsylvania, which is near Pittsburgh. He's a left-handed hitter with, according to the scouting reports, big power and a right field profile. Presumably he'll sign (he does have a college commitment to Liberty University), and also presumably he's five years or so away from showing up on the major league roster. He was the 15th overall pick. 56th pick: prep catcher Ben Rortvedt of Verona, Wisconsin. He was the first high school catcher taken. The ideal policy is to take the best player available, but the Twins system certainly needs catchers. MLB.com and Baseball America each ranked him in the 50s for this draft pool. 73rd pick: prep shortstop Jose Miranda of Puerto Rico. Not yet 18, right handed hitter, likely to get moved to second or third at some point. 74th pick: prep outfielder Akil Baddoo of Georgia. Some speed, some power, or so they said on the MLB Network draft show. All high schoolers, no collegians for the Twins on Day 1. It will be years if ever for any of them to reach the majors. But they're all guys to dream on, and dreams are what Twins fans have to lean on right now. Trevor May faced three hitters Wednesday. Wild pitch, double, double, single. Then came a homer off the next pitcher, and May was charged with three earned runs in zero innings. May's ERA is now 6.07. I rather expect him to go on the disabled list. #OldFriend Justin Morneau signed with the Chicago White Sox and was immediately placed on the disabled list. He had elbow surgery during the winter and says he hopes to be ready after the All Star break. It took almost two months, three blown saves, five losses and an ERA of 6.17, but Kevin Jepsen has apparently been deposed as closer. 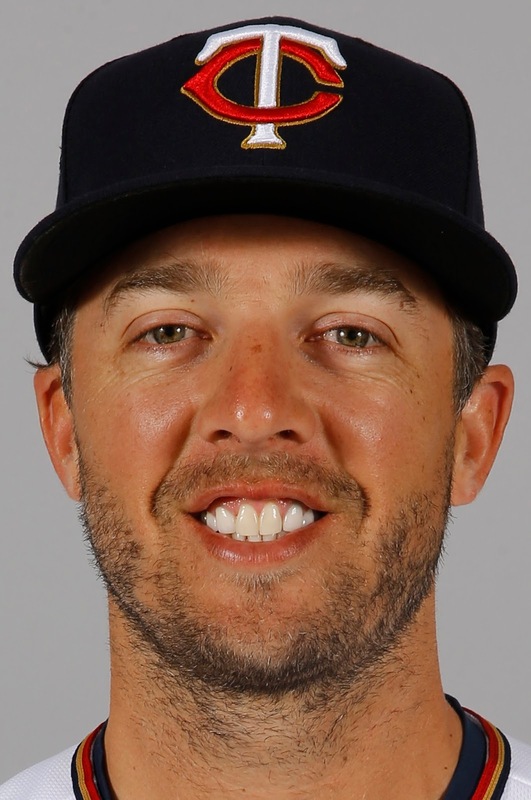 Brandon Kintzler got the call for the ninth inning Wednesday night, and the indy ball refugee allowed one single and picked up a strikeout to collect his first major league save. Kintzler is not, apparently, to be the closer. Paul Molitor indicated after the game that Fernando Abad is likely to get some opportunities. His next save will also be his first. I also wouldn't be stunned if Michael Tonkin or Trevor May found some save opps along the way. May, incidentally, made his first appearance in more than a week on Wednesday, face one hitter, got him out and left. It wasn't exactly a stint that made me feel confident that he's over his back/hip soreness. I doubt this job sharing thing will last long. It's not as easy as it sounds to do matchups and monitor workloads. Sooner or later, probably sooner, Molitor will pick somebody and give him the glory job. If nothing else, Glen Perkins might be nearly ready to go on a minor league rehab assignment. But it was time to back off on Jepsen -- not just for save situations, but for game situations, whether they be in the ninth, eighth or seventh innings. His appearances were bring back too many Ron Davis memories. There's probably a couple of generations of readers for whom that reference means little, but for those of us who were around in the 1980s, it can give us the shakes. The Twins won in 11 innings Tuesday night. Paul Molitor went through seven relievers after yet another short start (this one from Pat Dean), eight pitchers in all, and said after the game it felt like 18. Eight was enough. I'm sufficiently old to remember some Orioles teams in the 1970s that carried eight pitchers on the entire roster for weeks at a time. Earl Weaver used to say of pitching staffs that eight was too many and 12 was not enough -- meaning that if the starters were effective he didn't need more than three relievers, and if the starters didn't give him seven and eight innings time and again, the 'pen would be overworked. For Paul Molitor, 12 is not enough. Thirteen may not be either, but there are limits. With so many relievers trotting in from the bullpen, it was pretty obvious that Molitor was avoiding Trevor May. May hasn't appeared in more than a week -- his last outing came June 1, and was his fourth appearance in six days. Despite the layoff, May entered Tuesday tied for ninth in the AL in games pitched with 27. He's been worked hard. Twins used 7 relievers, but not Trevor May. Molitor said he's been bothered by soreness, apparently in his back, but could be OK Wednesday. I've started wondering if and when May will be pulled out of the bullpen role and redeployed to the rotation. The Twins insisted this spring even as they assigned him to relief that they view him as a long-term starter, they just didn't have an opening in a veteran rotation for him. That veteran rotation has been awful, and the Twins have started nine different pitchers already, but none of them have been May. But May has displayed command/control issues. He's walked 3.4 men per nine innings, and he's thrown six wild pitches in less than 30 innings. That's not a stat set that suggests he can get through six or seven innings on a regular basis, and that was an issue for him when he was in the rotation for the first half of 2015. However, nobody else is getting into the seventh every time out either. This ain't an Earl Weaver pitching staff. The baseball draft begins Thursday evening (first round to air on MLB Network), and that is presumably the immediate focus of most if not all front offices, although the active participation of the general managers themselves should be pretty limited. Terry Ryan is known for his scouting expertise, but he's not traveling the country looking at high school kids. The Twins draft 14th this year -- pretty much in the middle of the pack -- and there doesn't seem to be any genuine consensus about the top of the draft this year. A lot of names are said to be in play for the Phillies at No. 1, and there's a good chance that they will go a bit lower than the top of their draft board with 1-1 if they can strike a good bargain that will free up more pool money for tough signs later in the draft. The lack of clarity at the top of the draft makes the mock draft game even dicier than usual, and I have no idea who the Twins are likely to wind up with out of the first round. The organization has an obvious need for catchers, but I don't expect the Twins to pop one on the first day. The top rated backstop is likely to be gone before the Twins pick, and the next best might be there when the Twins pick (twice) in the second round. Picking for need in baseball is a silly proposition anyway; most picks are years away from helping the major league team. The Twins last year took a college reliever, Tyler Jay, with the sixth overall pick; he's in High A as a starter and thriving (2.44 ERA at Fort Myers with 55 strikeouts in 51-plus innings). The year before that, they took high school shortstop Nick Gordon; he's also thriving at Fort Myers. And the year before that they took high school righty Kohl Stewart, who just moved up from Fort Myers to Double A Chattanooga. None of those three will see Target Field this year. So the fact that three members of the 2012 draft -- Byron Buxton, J.O. Berrios and Taylor Rogers -- have been on the major league roster so far this year is worthy of notice. Monday's print column attempted to find a silver lining in the loss of two of the Twins regular outfielders to injury. At least the outfield defense will be better. And the pitching staff allowed 11 homers to Tampa Bay in the four-game weekend series. It does not matter if the center fielder is Danny Santana, Byron Buxton or Oswaldo Arcia; nobody can defend the second deck. So the Twins go into today's off day bearing a .286 winning percentage, 16-40, just a bit more than a third of the way through the season. That is the worst record in the majors, slightly worse than that of the Atlanta Braves, and the Braves were expected to be awful. It was certainly possible to doubt the optimism that accompanied the Twins at the end of spring training, but I (still) do not believe it is truly this bad a club. Starting to get there though. the San Diego Padres Tuesday in Seattle. Wow. This kind of photo always amazes me. Looking for the silver lining in yet another Twins loss Friday night: Byron Buxton had two hits, including a blindingly fast triple. Buxton, according to Statcast, went home-to-third in 10.69 seconds. For context, a batter getting to first in under 4 seconds is rare. 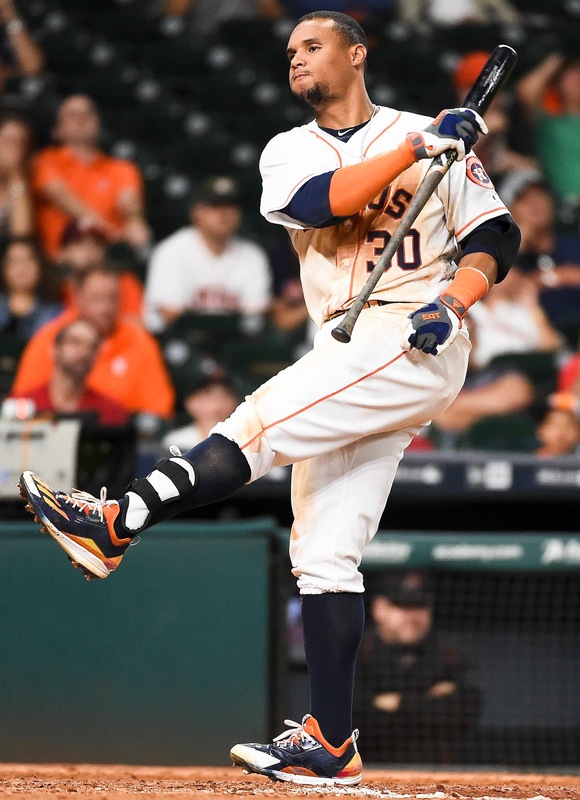 Buxton has had at least one hit in each game since his return and has goosed his batting average for the season to .200. That's a positive. On the other hand, he's also had at least one strikeout in each game since his return. That's less good. Kyle Gibson was supposed to come off the disabled list and start Thursday, but the right-hander reported sciatic issues. Phil Hughes, who was assigned to the bullpen after his last start but had yet to actually relieve, started. Four innings, nine hits, four runs, 63 pitches. 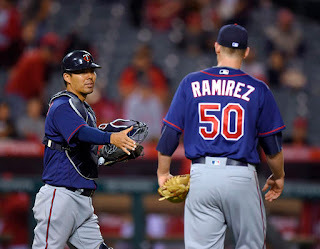 The Twins won, but that hardly earns him a reprieve from the bullpen assignment. So ... Gibson remains on the disabled list indefinitely. The Twins have an off day Monday, and so they could skip this rotation slot the next time around, but eventually they'll need a fifth starter. If Gibson's back issues sideline him long enough, he'll need to redo the rehab assignment routine. There are, obviously, significant drawbacks to each. Milone would require cutting somebody from the 40-man roster, and the Twins have already lost three players on waivers this season (John Hicks, Casey Fien, J.R. Graham). But he's the one who seems the best bet to actually, you know, get people out as a starter. The Twins don't have to make that decision now, but they probably have it in mind. Byrd is 38. Because this is his second time caught, he's suspended 162 games. There's a pretty good chance his career is over. But that's true of pretty much any player in his late 30s, much less one who was never really a star. Byrd claims that he took a tainted supplement that wasn't on the approved list. Maybe so, but again -- second time. It's difficult to give him the benefit of the doubt. And according to Baseball Reference, he's pulled in more than $16 million since his 2012 suspension. On a risk-reward basis, considering where he was on the career arc at the time, there was an incentive for him to cheat, and if he was cheating the past three years, it paid off for him. But looking at Verlander's angry emoticon reminds me: It's easy for players to denounce users on other teams. We didn't see or hear Verlander rejecting the return of Jhonny Peralta for the playoffs in 2013. Peralta hit a crucial homer in the postseason, then landed a $53 million contract from the Cardinals. One can understand the frustration of clean players with the guys who appear to profit from steroid use. But it seems to me that the continuing cycle of clubhouse acceptance of those same players helps permit it. The guys who served as replacement players during the 1994-95 strike were never accepted by their teammates the way those who've tested positive for PEDs are. When the players lash out at the positive testers who wear the same uniform, I'll take the outrage more seriously. on Tuesday night in Oakland. probably refuels the continuing fan debate over putting him in the outfield to begin with. Sano had homered in four straight games coming into Monday. He leads the club in homers, runs, RBIs and doubles. Despite all that, he's barely above zero in WAR, Wins Above Replacement, because of his struggles afield. If WAR has the defensive component right (and that is a significant if), Sano's injury really doesn't hurt the team very much. We saw some of those defensive issues Tuesday night. Billy Burns of Oakland hit a flare down the right field line, and Sano had an awkward approach in which he came to a stop and waved his glove futilely at the ball as it bounced past. Triple, ruled the official scorer. Sano may have done something to the hamstring on that play, but it was beating out a possible double play ball that caused him to pull up lame. So he's out for at least two weeks, and Max Kepler has been called back up. I would expect the right field opportunity to go to either Kepler or Oswaldo Arcia. I much prefer Kepler. Watching Arcia chase another neck-high fastball in the ninth inning Tuesday night underlines that preference. And if Kepler is in right, an outfield of Robbie Grossman-Byron Buxton-Kepler will be quite rangy. As for Sano: The big guy spent much of his Twins tenure last season nursing a hamstring issue, which was part of why he was almost exclusively a designated hitter. One of the concerns, at least outside the organization, with moving Sano to the outfield was the risk of injury. Connecting the dots here may merely result in an illusionary image, but humans are conditioned to see cause-and-effect even when there isn't. Some of us expected an outfielder weighing as much as 280 pounds to get hurt out there. Now he is hurt, and maybe playing outfield is a reason and maybe it wasn't. But the Twins need his bat, and now his bat is absent for at least two weeks. Next man up.